Volvo engineers' mission with the 360c concept was to have the car tell riders what will happen next. In a world in which we are all about to become back-seat drivers, autonomous vehicle developers are working to let passengers know what the car sees and comprehends as it moves. Many surveys over the past few years have shown that consumers are skeptical about the safety of self-driving vehicles. An Axios/Survey Monkey poll in October showed that about two-thirds of those surveyed said they felt unsafe around autonomous vehicles. A AAA survey in May showed similar results, with 73 percent saying they felt too unsafe to ride in self-driving cars and 63 percent saying they felt unsafe near them. Automakers and suppliers know that one of the first consumer battles they need to win will be for the trust of passengers and pedestrians. "It's about gaining trust, and the way that we do that is by making sure there are a lot of communications in a lot of different ways back to the person in the car," said Tisha Johnson, Volvo's vice president of interior design. "In a good relationship, over-communication is a good thing." Cars will also need to communicate with pedestrians and other vehicles on the road, especially in the period when human-driven cars and self-driving vehicles share the road. But if companies are coming up with their own solutions, the result could be confusion for everyone, said Aine Denari, senior vice president of planning and business development for ZF. "This is an emerging area, and we need to drive toward standardizations," Denari said. Chinese startup Borgward is going all in on ensuring that its artificial intelligence is front and center in its upcoming autonomous vehicles. "Right now, it's a black box for riders," said Joe Xing, Borgward's head of AI. "We want our riders to feel that they are very safe inside our cars." Borgward plans to make its self-driving technology, especially its prediction capabilities, known to cabin occupants. One of Xing's examples is a self-driving car — Xing calls it a carbot — that notices another vehicle engaging in dangerous behavior. "We want to let the riders know there is something risky going on here," he said. 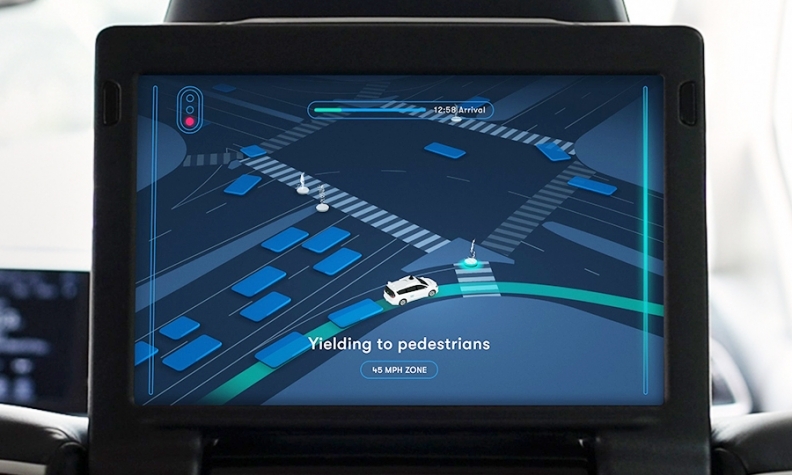 The feature could be a view of the outside world on the car's infotainment screen with augmented reality notifications around the potential problems, Xing said. Today's Teslas, he said, already recognize other vehicles and show them as animated icons on the driver's screen, but that's not good enough. "What we want to do is not just recognize the cars, but predict what those cars are doing. So, if the car might be a drunk driver, it might be colored red, telling you to pay attention to it." Borgward's vehicles are also trying to forecast collisions. "If you see two cars, one on your left and one on your right, on the highway, sometimes, both of them are trying to merge to the same lane. The algorithm can see that and predict it, and maybe mark that zone as yellow or red." Waymo, which is testing self-driving Chrysler Pacifica minivans in Phoenix, wants the in-cabin screens in its autonomous vehicles to share what the vehicle sees and thinks, without overloading riders with information. On the screens, placed on the back of the front seats facing passengers in the back, images of pedestrians, dogs, other vehicles and trees fade in and out as the minivan moves down the road. The screen highlights pedestrians and cyclists and renders them using the actual laser points, so passengers can see their arms and legs move. The screen also communicates what the Waymo vehicle is thinking or doing. For example, if the minivan stops at a crosswalk, the screen will highlight the crosswalk to tell passengers that there's a pedestrian crossing and will display a message that it's yielding for the pedestrian. Liz Markman, a Waymo spokeswoman, said the screens are meant to replace the verbal and nonverbal communication between a human driver and passengers. "Often people are experiencing this technology for the first time in our vehicles, so our screens are a way they begin to understand how it works, and get visibility into what the car is seeing and doing," she said. Volvo designers also favor clear communication from the AI to riders. 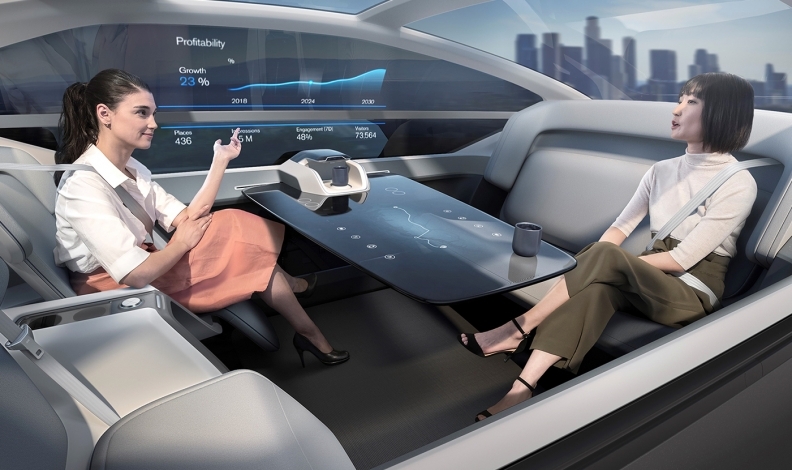 In September, the Swedish brand introduced its 360c concept, which offers ways for the AI to communicate with the passenger. The car's smart tablet, for example, can be used as a display during an in-car meeting but also can let riders know when it is safe to unfasten their seat belts. For Volvo engineers, the mission was to have the car tell the riders what will happen next. A Waymo screen communicates what the vehicle thinks. Those messages could be images, text or sound, Johnson said. "We did a deep set of research on how people communicate without words, interpersonal sounds that we all understand mean the same thing, and we incorporated that into the communication," she said. These sounds, she said, can let riders know when the car is ready to accelerate, decelerate or is about to turn. Robin Page, Volvo's head of design, said even with all of the research that went into the 360c, it's just an early step in understanding what autonomous vehicle interiors will be like. Once vehicles can communicate effectively with passengers, other issues will pop up. "This concept was really an exploration of the challenges that we've got ahead," he said. "We haven't got all the answers. What we need to do is explore this a bit more, and get a better understanding. There's a lot more work that needs to be done. We're on a journey."